Given the transient nature of mobile games it might be useful to occasionally take a snapshot of the games I currently have in rotation (in a ‘New Games’ folder on the first page of my iPhone’s menu). Even from this tiny sample it’s possible to see how many iOS games that until recently would have been sold as premium apps have moved to the free-to-play model. Some of the games using this model don’t even feature ads in the free version, depending solely on in-app purchases for revenue. In terms of content, there’s the usual mix of rich, console-style games and simple microgames. Both approaches are valid, and confound attempts to encapsulate a single ‘correct’ formula for designing and marketing smartphone games. The indie game that seems to have generated the most buzz over the last few weeks (helped in no small part by the tireless PR efforts of co-creator Andrew J Smith) is Spilt Milk Studios’ Hard Lines. 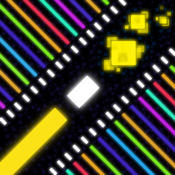 A minimalistic mash-up of Snake, Tron’s light cycles and Geometry Wars’ art style, Hard Lines features six distinct playing modes, all of which involve guiding your single-pixel-wide line (Lionel) by swiping in the desired direction, collecting ‘shiny bits’ and avoiding crashing into walls and AI-controlled enemy lines. The controls are nice and responsive (negotiating tight corners and slipping your line through narrow gaps is as satisfying as in every other snake/tron game), but the game is slightly marred by the speed with which it can detect swipes (noticeably slower than a d-pad), and slight frame-rate hitches when multiple enemies are spawned. There doesn’t seem to be any Game Center support either, although presumably it’s imminent. The game is a kind of physics-based arcade puzzler. Different-coloured balls are arranged on a table with no pockets. When two balls of the same colour collide they stick together. The aim of the game is to take (extremely delicate and painstaking) shots with the aim of sticking together all the balls of the same colour (which are then removed from the table). The presentation is top notch (on a par with the likes of Cut the Rope), and the controls work well on the touchscreen (although annoyingly there’s no way to set the shot direction and power separately, and the player’s finger can obscure the action a lot when playing in iPhone/iPod). Game Center integration is particularly polished, with achievement notifications and icons matching the style of the game. The audio lets the side down a bit, ditching the old-timey piano tune and ‘crowd exclamations’ of the PC version and introducing a load of weird, discordant FX including doorbells and synthesized speech. The basic ‘casual’ game mode (which can be played through in a couple of hours, but also works as a score attack game) is free, with in-app purchases available to unlock extra tables and game modes. The best value option though has to be the Skeleton Key, which for a one-off payment of £2.49 closes the shop and gives the player access to all current and future downloadable content. 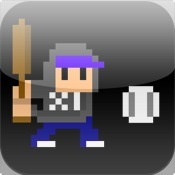 In summary, the game is worth at least taking for a spin on iPhone, and a must-have on iPad. Away from the garage indie scene, an ever-growing number of console and PC devs are setting their sights on mobile and downloadable games. Quiz Climber is Buzz! 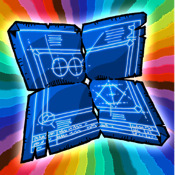 creators Relentless Software’s first foray into iOS, and draws on their years of experience of making trivia games accessible and entertaining to a mainstream audience. There are already lots of mobile trivia games (from big brands like Who Wants to be a Millionaire and Trivial Pursuit to word-of-mouth hits like MovieCat), but as Rovio have shown there’s a big difference between being the first game to do something and the first to do it well. Quiz Climber dispenses with the set dressing of trying to emulate a game show, parlour game or pub quiz machine. The goal of the game is to simply answer as many (increasingly-difficult) questions as possible without getting one wrong. There’s a facebook-powered weekly leaderboard (a la Bejeweled Blitz), and a mechanic whereby you can buy or earn ‘lifelines’, consumable joker cards that can be played once per game to continue after a wrong answer. The game is available in a free, ad-supported version as well as an adless premium version (£1.49). At present, the game feels a little bit barebones to justify the premium price. Hopefully future updates will address this – and with a central mechanic as universal as a trivia quiz there’s a huge number of ways they could extend it. New game modes, twitter and/or Game Center integration, themed questions, gameplay stats, the ability to issue challenges to other players, and perhaps more of a metagame to grind through (I know a lot of people think Upgrade Shops are evil, but I sometimes like ’em) could all add something to the experience. Coin Drop! by Fullfat Games is a slightly older game that I’ve only recently gotten around to playing. 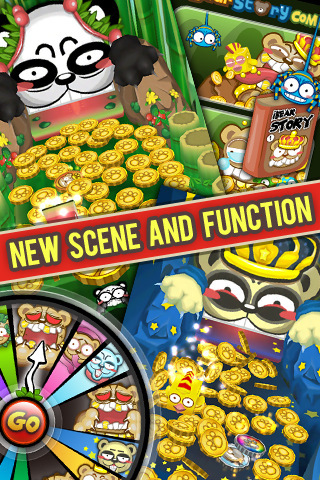 It’s a puzzle game in the mould of Peggle and Sushi Cat, where you drop coins into a series of pachinko-esque boards populated with various moving, destructible, helpful or hazardous gadgets. The main objective of each stage is to ‘capture’ four bad coins by hitting them with one of your own coins, but there are also bonuses for everything from hitting all the pegs on a stage to destroying all the bricks. Coin Drop’s main points of interest are the sheer amount of content (there are currently five themed worlds, not including the tutorials) and the stupendous quality of the presentation. Every inch of the game is bursting with bouncy animations and slick particle effects many of which most players won’t even notice. On the downside, the levels can be munched through quite quickly, and more seriously there’s always a nagging feeling that the game is weighted a little too much toward persistence than actual skill. (On many levels there are too many pegs and obstructions to realistically predict where your coins are going to end up – as with Portal 2, the best levels are subtly arranged to guide the player to specific pre-designed solutions.) Still, while it lasts it’s a very inventive game presented to a standard that would make even Nintendo proud (albeit while feeling a twinge of familiarity). I’m slightly ashamed to say that the iPhone game that I’ve probably clocked up the most hours on in the last fortnight has been iBear Story: Coin Push Pro. “Bear Coin” (as its icon is captioned) is yet another game that emulates an arcade ‘coin-pusher’ machine (a.k.a. 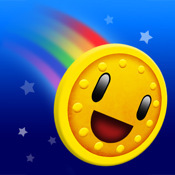 a Penny Falls machine), following in the footsteps of the wildly popular Coin Dozer. (Stuart Campbell has recently written an overview of this peculiar breed of game.) For some inexplicable reason that I can only guess might be a Chinese play on words, the moving shelf is replaced with a large cartoon bear who pushes the coins with his rectangular tongue. 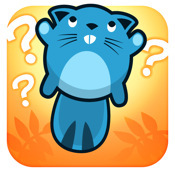 In terms of implementation and design, Bear Coin is a major improvement on Coin Dozer. The game’s prizes (the 3D trinkets that are occasionally dropped into the playing field) can be collected to gradually power up gameplay effects (such as making coins regenerate faster, or increasing the odds that a coin that falls into the gutters will be counted as collected). Certain special coins activate alternate ‘scenes’, which reskin the table for a limited time and introduce beneficial gameplay effects. (The ‘ice’ scene makes the coin shelf slippery; the ‘bamboo’ scene raises the walls most of the time; the ‘night’ scene makes the bear mash his fists on the table every 60 seconds.) There are no ads in the free version. And just as importantly, the game actually runs at a decent frame-rate most of the time. Considered rationally, these coin-pushers are barely games at all, simply mechanisms to drip-feed the ancient rodent parts of our brains with the pleasure of hoarding shiny jingling coins, much like Vegas slot machines. Of course, I can say that now that I’ve amassed enough power-ups to make the coin and XP counters meaningless. Again I’m reminded why I should never start playing World of Warcraft. Berzerk Ball is a direct port of Berzerk Studios’ heavily self-referential Flash ‘launching game’, Homerun in Berzerk Land. 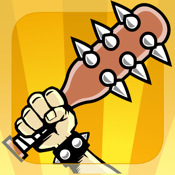 For those who haven’t clicked the link (or are browsing from kind of artificially-crippled device that can’t run Flash), Berzerk Ball is a variant of Toss the Turtle, where the player (as a bizarre Viking version of one of the game’s developers) has so smack a complaining nerd into the air with a baseball bat. The goal of the game is to hit the nerd as high and as far as possible. After each round, the player can spend XP and money on upgrading their character and their weapon. There isn’t a lot that the player can do to influence the nerd’s flight once he’s in the air, and Berzerk’s signature art style isn’t terribly attractive (especially shrunk down and converted to bitmaps on the iPhone screen). The upgrade shop compulsion loop makes the game work as an occasional time-waster, but without any skill or enjoyable feedback involved it’s not very addictive. (I expect I’m now going to get quoted by the nerd in a future version of the game.) Now, if someone were to port Burrito Bison to iOS, that would be an altogether different kettle of fish… oh jeezus, they are! Death Rally is a modernised remake of Remedy’s 1996 top-down racing game, a kind of post-apocalyptic version of Micro Machines with the gimmick of having Duke Nukem as one of the rival drivers. It’s also a game where the gameplay experience differed wildly from the expectations that I’d formed from the screenshots. The game has about half a dozen tracks (which it gets more mileage from by flipping and rotating), and instead of playing through a grand prix structure, the player is endlessly presented with new ‘challenges’, where the tracks are raced at different difficulty levels and with different arbitrary rules in place (such as making all the racers use a certain weapon, making all the pick-ups cash, or subjecting the player to a 42-lap marathon). For the first half of the game your car and guns are too crap to ever place first in a race, and the game devolves into grinding to earn more ‘fame’ points to upgrade them. Eventually a tipping point is reached when your weapons are so powerful that the game becomes completely unchallenging. The way to ‘complete’ the game is to keep playing until you’ve maxed everything out and have reached the highest notoriety ranking. I only discovered this by checking the game stats. There’s no ending sequence. Death Rally is strange in that it’s a highly technically accomplished game where the actual ‘game’ doesn’t really work – it’s not ‘addictive’ as much as it’s like going into a hypnotic fugue. 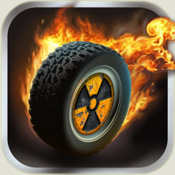 Not even an update (the game’s sixth) that introduced an AI deathmatch mode and a monster truck helped very much. I’m told that Sonic All Stars Racing is the current gold standard for iOS racing games, so perhaps give that a shot instead? Last but by no means least, XLARGE X-Baseball is another retro-styled one-button microgame by masters of the genre Poppy (makers of the similarly excellent King of Tennis). You’re a baseball batter. You tap the screen to hit balls that are pitched to you. Three strikes and you’re out. That’s pretty much it, except also you can hit birds out of the sky for bonus points, and hit bunches of bananas that are chucked from the crowd to earn back strikes. And then after a while strange and literally, genuinely, involuntarily-yelp-in-delight-on-the-bus hilarious things start to happen. I don’t want to spoil the surprise. It’s free. Get it now.